Use the amounts of ingredients as a guideline. You may like it hotter or sweeter. 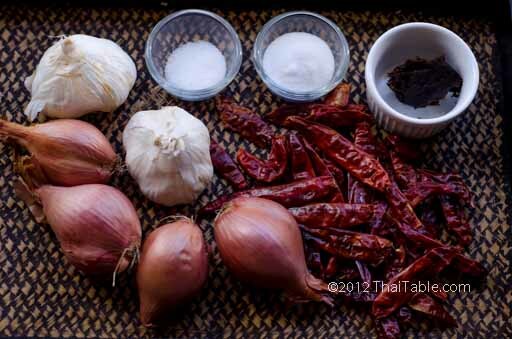 Chili paste can be made the old fashioned way, with mortar and pestle. The result is a smoother paste. 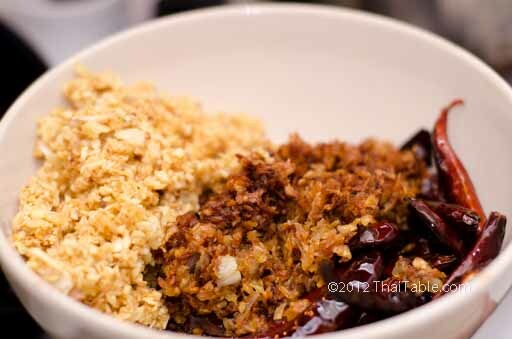 Although olive oil is not a part of Thai cuisine, I use it instead of cooking oil. Even extra virgin olive oil doesn't change the taste or introduce any strange flavors. If you have a hard time finding shallots, you can use red onions. If you use onions, you will probably want to use less sugar. Peel shallots and garlic. The uncut shallots and garlic should roughly each fit into a cup. A little more or a little less should be ok. 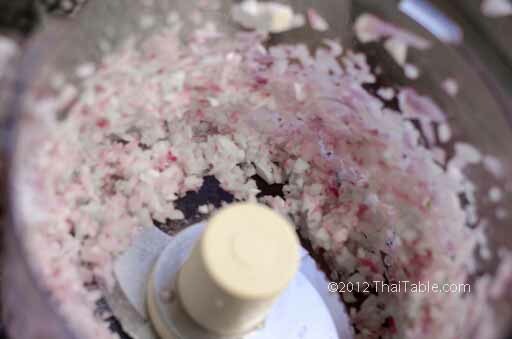 In a food processor, mince shallots (picture 2). And separately mince garlic (picture 3). We'll be frying each separately since they cook at a different rates. Garlic has a lot less water and cooks faster than shallots. Add ¼ cup of oil into a pan over medium low heat. 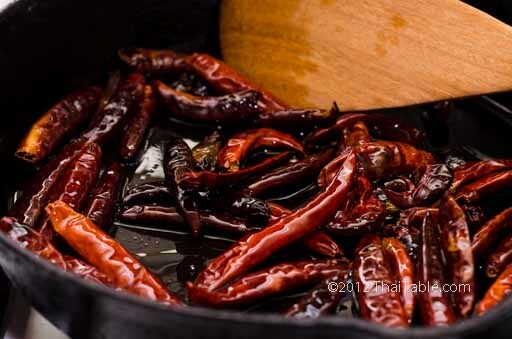 Add the dried chili peppers and constantly turn each pepper over to prevent burning (picture 4). If the peppers are turning dark too quickly, lower the heat. After a couple of minutes, they should puff up and turn dark. Scoop out the peppers and set aside in a large, heat tolerant bowl. 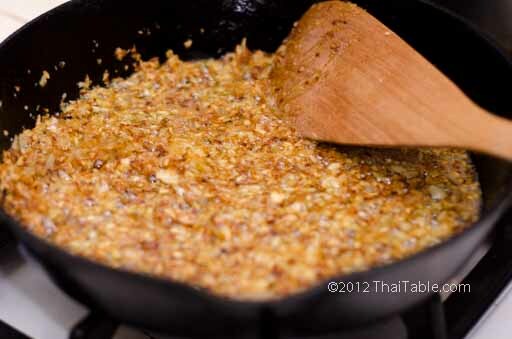 Add the minced shallots into the same pan that you fried peppers. Add ½ cup of oil. Turn up the heat to high. Stir the shallots to mix with the oil. The oil should be hot and bubbling up. It will take about 10 minutes to get the shallots to turn light brown (picture 5). When it does, pour the shallots and oil into the same container with the fried peppers. Add ½ cup of oil into the same pan. Lower the heat to medium, add minced garlic. Stir to mix the garlic with oil. The oil should be bubbling. 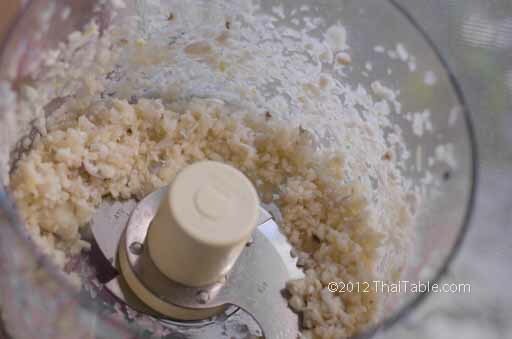 After 4 minutes, the garlic should turn light brown (picture 6). 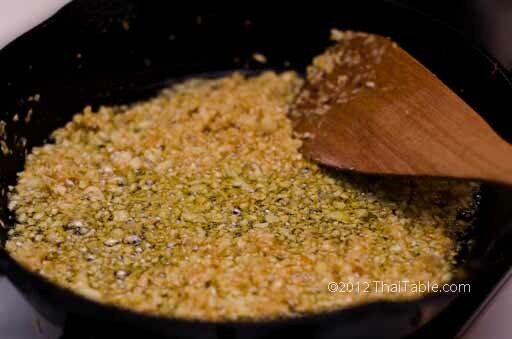 Pour the oil and garlic into the bowl with other fried items (picture 7). Add the fried peppers, shallots and garlic into the food processor. 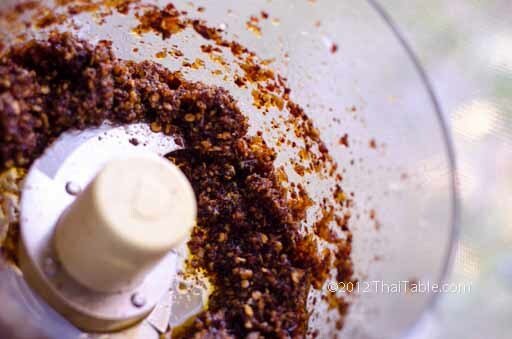 Add sugar, salt and tamarind paste into the food processor. Pulse until well mixed, about ½ a minute (picture 8). Pour the mixture into the pan that you used previously for frying ingredients. Add the rest of the oil. 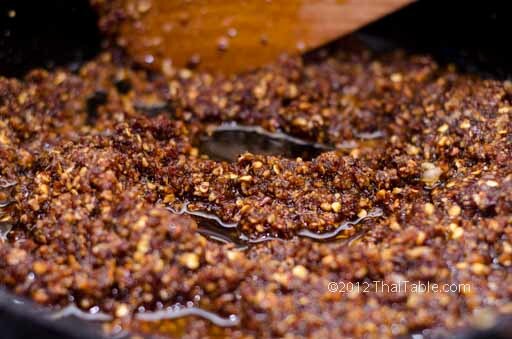 Fry the chili paste over medium low heat (picture 9). Take a small piece and taste. You may want to add additional salt, sugar or tamarind paste or perhaps not. 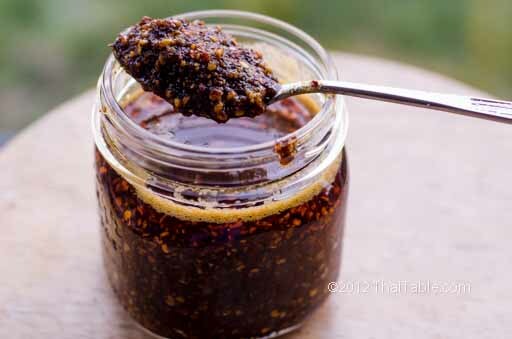 Over low heat, you can fry the chili paste as long as 15 minutes or as short as a couple of minutes. This final frying is to adjust the seasonings, let the flavors come together and kill off anything that can grow.